QUESTION: Martin, I know your computer has a prediction for the French election and I am sure you have an opinion, I am of the opinion that the French deplorables will come out in mass to vote for LePen. Vive la France!!! What is your opinion. This could be the event that crumbles the EU for good. Thoughts? ANSWER: This is the craziest election because the computer projected Le Pen would beat both the socialists and the conservatives back in 2015. I gave that forecast back then when it really sounded nuts. It’s my job to say what the computer is forecasting. I have learned over the years that my opinion comes in second-place. So strangely, the computer is correct even if Macron wins because all mainstream parties were defeated by Le Pen in the first round. I really hope Le Pen wins because that will force Brussels to look in a mirror just once. If Macron wins, we are looking at a very hard landing for the EU next year. This will probably rise up even violently and places Europe at risk of civil war from the standpoint that Brussels has federalized Europe behind everyone’s back. The French polls being reported put Macron at 63% and Le Pen at 37%. Her followers will be more passionate about voting and the polls are making a serious mistake as they did in BREXIT. They are trying to manipulate the election. Even Brussels is desperately trying to hand out huge bills to leave. They want €100 billion from Britain and they have threatened Italy and France if they try to leave. How do they enforce their demands? Invade with the federal army they are trying to build? Or will Germany, Netherlands and others lend troops to invade Italy or France? Oh, let’s see. The reason to federalize Europe was to eliminate European War. Hm! 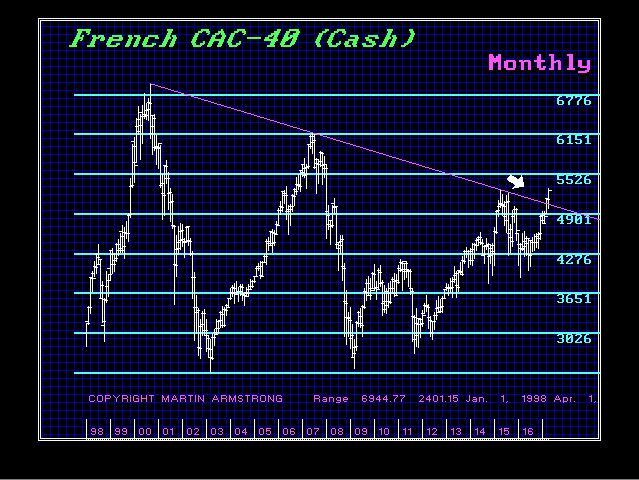 The CAC40 has finally broken the Downtrend Line on the Monthly Chart. This has not been because of bullishness for the French Economy – this is capital fleeing the government sectors and running into private assets. With BREXIT, the bankers support the government ALWAYS!!!!!!!!!!!!!!!!!!!!!!!!!!!!!!!!!!!!!!!!!!!!!!!!!!!!!!!!!!! Even HSBC said they would leave Britain if BREXIT passed and move to Paris. Hm. The European banking system is in serious danger of crumbling. A good stiff wind can blow it over. ANY bank that were to be stupid enough to move to the EU is a MAJOR SHORT for the long-term.